Notes From the Playground: Misspent Youth #2: Geronimo!!! 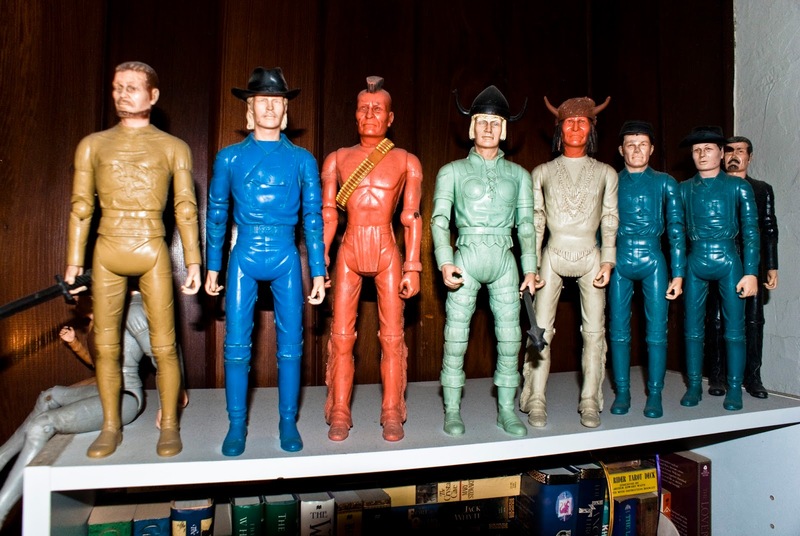 My favorite toys as a child were action figures. Pretty specifically a line from Marx Toys called The Best of the West. The cowboy Johnny West was the main character but there were soldiers and Indians and a full West family including Johnny’s wife, two sons and two daughters. I had most of these. There were also two medieval knights (my favorites), and two vikings, of which I only ever owned one. They came with a wide assortment of accessories. 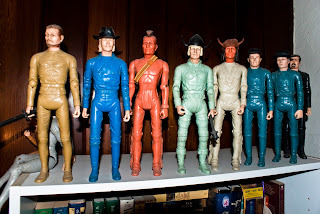 I still have many of the figures, though some of them are lost to time (and the memory of why some are missing). I have a few hats and swords left, but that’s about all. These are the figures I have left. They're standing on top of a bookshelf in my living room. In first grade I took my Geronimo figure with me to school. I don’t know if it was a show and tell day, or if I just wanted to take it to show my friends because I loved it so much. During recess outside I started to throw it high in the air and then catch it when it came back down. I’m fairly certain I was shouting ‟Geronimo!! !” when I did this because for some reason that’s what you shout when jumping out of a plane or off something high. A friend asked if he could do it and I said Yes. I’m certain it didn’t happen on his first throw, and I’m equally certain it wasn’t intentional, but, on one of his trips to the sky Geronimo ended up landing on the roof of the school. There were tears, mine and his. I think I yelled at him and told him he had to buy me a new one. The teacher came over and tried to comfort us. What no one did was make any effort to retrieve it. It was a small country school and all of the teachers were ancient, so I understand why they didn’t climb up there. But, we did have a maintenance guy, and there were ladders. But no one went up to get it. Every day at school after that I would see Geronimo laying at the edge of the roof. Over summer vacation, every time we drove by, there he was. The following year, when my class was bussed to different school, every day through the bus window I saw Geronimo, abandoned to his fate. I saw him soaked by rain. I saw him covered in leaves. I saw him buried in snow. One day while the bus was stopped in front of the school, discharging the kids who went there while the rest of used stayed seated to go on, I noticed Geronimo was no longer on the roof. The maintenance man got on the bus and handed him to me. He explained that someone had kicked a football and it got stuck on the roof. While he was up there he got my action figure as well. Little Wayne learned a valuable lesson that day about what we value as a society. My toy, something really, really important to me at the time, and my tears, was not important enough to justify getting the ladder out of storage and climbing to the roof. But, one single football gets kicked up there and everyone leaps into action. Thanks for making my feelings and values an afterthought, Janitor Jim. I’m still a little bitter.